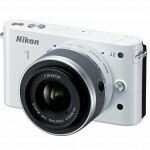 A third Nikon 1 mirrorless interchangeable lens camera has been announced – the Nikon J2. The Nikon 1 System was announced last September – a little less than a year ago. The first two cameras, the J1 and V1, received mixed response at first, due to the small 10-megapixel “CX” format sensor. The Nikon 1 System image quality turned out to be surprisingly competitive, though. But what really made photographers and camera journalists excited (this one, anyway) was the outstanding speed and auto focus performance of the System 1 cameras. 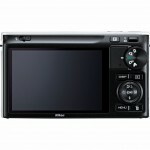 With 60 frames per second full resolution burst and sports-worthy continuous auto focus for both stills and video (read my Nikon J1 pro review), the Nikon 1 System was a different animal than other compact system cameras – and even outperformed pro-level sports DSLRs in some respects. I don’t think it would really be accurate to call the Nikon J2 a second generation System 1 camera. The new camera might have been more accurately named the Nikon J1.2. The core components, the 10-megapixel CX-format sensor, EXPEED 3 processing, the camera design and the groundbreaking hybrid auto focus system, remain the same and improvements are minimal. The main updates are a higher resolution LCD display, the addition of a Creative Mode on the mode dial, a couple of new body colors, and the retraction switch on the lenses now doubles as a power switch. The J2 price is also $100 lower than the J1 was when it was launched. There really isn’t much more to say about the Nikon J2. As far as performance goes it’s pretty much the same camera as the J1. I think the most important change is making the retraction switch on the lenses act as a power switch. That will make the camera a lot faster at startup. The Creative Mode is a nice addition offering easier, more intuitive access to manual shooting modes (P,A, S, M) and adding scene and in-camera filter modes like Selective Color, Miniature, Soft, Panorama, Night Portraits and more. Using the manual modes on the J1 was a little confusing. But I don’t think anyone’s going to replace their J1 with a J2 just to get the Creative Mode. I can’t help but wonder if the J2 announcement is meant to fill a gap in the production schedule until there’s a real update for the Nikon 1 System. On the other hand, photographers who’ve been holding out on buying a new high-end compact or a mirrorless camera may be ready to jump in now. The Nikon J2 is a solid choice for anyone who doesn’t own an interchangeable lens camera or photographers who want a compact compliment to their digital SLR. 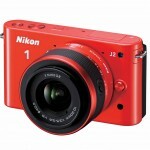 And for outdoor action sports photographers – especially those who plan to do a lot of video – the Nikon 1’s super-fast burst and hybrid auto focus system arguably makes it the best compact camera available. More interesting than the camera itself are two new accessories being announced with it – a compact 11-27.5mm f/3.5-5.6 System 1 zoom lens and a new underwater housing that’s rated for 130 feet (40 meters). Since the standard Nikon 1 kit lens is a 10-30mm zoom, the shorter 2.5x zoom lens (30-74mm equivalent) may seem like a strange option. 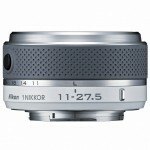 However, Nikon tech reps tell me that the new 11-27mm zoom is about 25% smaller and lighter than the standard kit lens. Most photographers who already own the 10-30mm zoom probably won’t be interested. But people buying the Nikon V1 without a lens or photographers who want their Nikon 1 system to be even smaller have a new option now. The Nikon J2 will be available in white, black, silver, pink and two new finishes – an outdoorsy metallic orange and a new “deep red.” It will be sold as a kit with the standard 10-30mm f/3.5-5.6 (27-81mm equiv.) zoom for US $549.95 – that’s $100 less than the J1 kit originally sold for. The J2 is scheduled to be in stores next month (September, 2012). The new 11-27.5mm f/3.5-5.6 zoom lens and WP-N1 underwater housing should also be available in September for $189.95 and $749.95, respectively.